Austria said today it could expel up to 60 Turkish-funded imams and their families and would shut down seven mosques as part of a crackdown on ‘political Islam’ that was described as ‘just the beginning’, triggering fury in Ankara. Labels: Kim du Toit, What? You're not an Islamophobe? Why in heaven's name not? It's quite remarkable that so many people who think of themselves as centrists, or maybe slightly to the right of the median, are being labelled "far-right" just because they disagree with the notion that everyone should leave their country's doors open to any thugs who may want to come in and commit crimes. That's the media for you, or as the Blogfather said, "Democrats with bylines." I'm puzzled by the cartoon, though- usually Ramirez hits the ball out of the park, but I just don't understand this one. 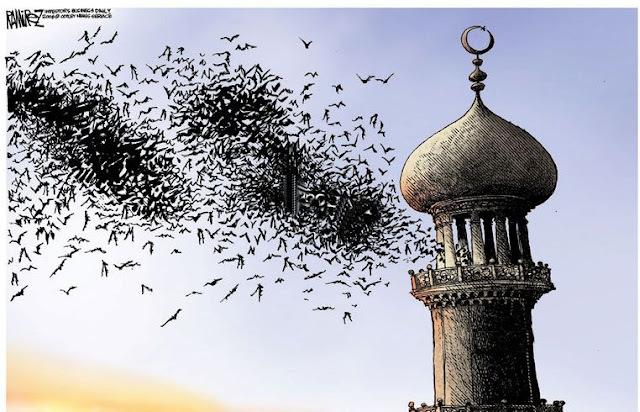 Bats flying out of a (mosque) belfry? Carrying something I can't make out? What does it all mean? Someone who gets it please help! Big round of applause for leaders with brains and balls! !